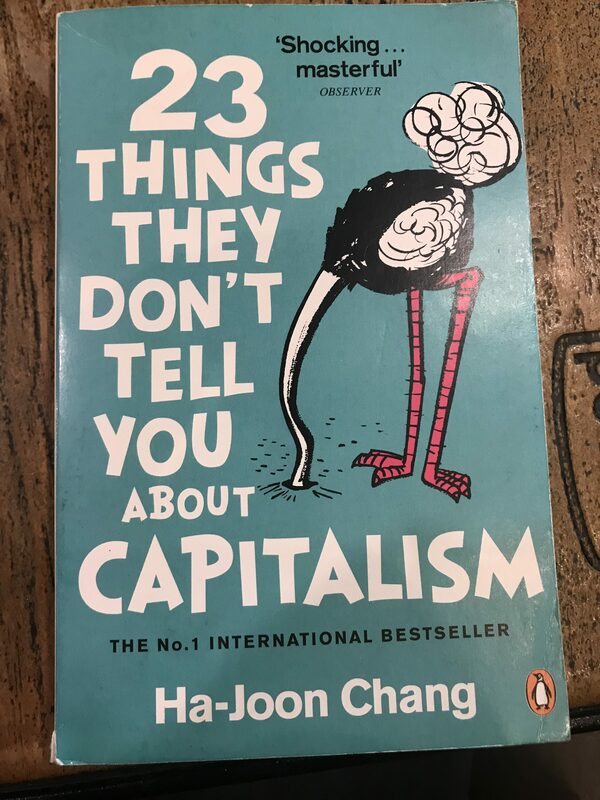 CHAPTER-BY-CHAPTER CRITIQUE OF 23 THINGS THEY DON’T TELL YOU ABOUT CAPITALISM: Thing 2: Companies should not be run in the interest of their owners. What the free-marketers have promised is at best half true. Free markets make economies worse off than the correct alternative policies. Capitalism remains the answer, but government intervention is necessary to make it work. The book is based on the formula that free-marketers are guilty of peddling myths, and the author’s business is to debunk those myths (“things” the reader presumably does not know) – one per chapter. For that reason it is convenient to follow the same formula to criticise the points the author makes. The basic premise of this chapter at first seems seductive. The author points out that in the 18th and 19th centuries limited-liability companies were the exception rather than the rule. Governments granted a dispensation permitting limited liability by exception, and only late in the 19th and early in the 20th century was limited liability a common phenomenon. The suggestion is of course that it required the intervention of the state to bring about the undoubtedly beneficial phenomenon of limited-liability companies, which allowed shareholders to feel much freer to invest their capital, as they would not be open to claims instituted by creditors of the company. That set in motion the positive cycle of investments that aided the industrial revolution so much. The basic fallacy underlying this argument is of course the assumption that it was government intervention that allowed limited-liability companies to come about. The truth is (and this is even apparent from the author’s own account) that for years the government prohibited limited-liability companies, except for certain state monopolies and so on. Far from being the facilitator of limited liability, the state for years prevented it. Just think about it logically for a moment: In a truly free market surely nothing prevents a company from declaring itself a limited-liability company? Any party contracting with that company would then know that it is a condition of any deal with the company that shareholders may not be sued if there is a dispute. Contracting parties would then be free to choose whether to enter into a contract with the company on that basis or not. A further fallacy in the author’s thinking is the idea that, because of the limited-liability status so graciously bestowed on companies (to benefit and protect their shareholders) the shareholders are protected and run no risk. It is of course true that they cannot be sued for damages and other claims from creditors, but surely it is they who risk their hard-earned capital by investing it in the company? If that bet fails, and the company is liquidated, they lose their investment. Why should they not be rewarded by the company managing itself to improve shareholder value? Take the owner of the corner shop, a sole proprietorship. He is presumably entitled, as the sole investor, to run the business in his own interest and that of his family? If that is so, then why may the company not be run in the interests of its owners? From there the author then proceeds to demonstrate that in the US two historical developments occurred: the traditional family business of the late 19th and early 20th century disappeared, and in the eighties it became vogue to run a business in the interests of its shareholders, which in turn resulted in company buy-backs of their own shares, which reached a climax at the time of the 2008 crash. If we ignore for a moment that the second period is inclusive of the biggest post-depression financial crash in the history of the US, then the point seems to be made. Growth rates slowed down in the era of shareholder maximisation, not so? The author’s explanation for the slowdown seems to be that, contrary to free-market countries like the US and the UK, some countries in Europe and the East did not suffer in the same way due to the emphasis on shareholder value, and indeed because these countries had mechanisms preventing such buybacks and consequent large pay-outs to managers and shareholders, outsourcing and off-shoring of labour, dismissal of workers and suppression of wages. Such measures include “stabilizing” large shareholdings for the state (France), differential voting rights for founder families (Sweden), supervisory boards for workers (Germany), cross-shareholding among companies (Japan). So it is clear that all the countries suffered downturns in their income in the second period. So whatever it was that caused the downturn, also did so in the non-Anglo-American countries. And equally importantly, the measures that were supposed to stop share buybacks, did not succeed in preventing the fallout in terms of growth. In other words, over time, wealthy countries tend to grow more slowly. France and Japan, for all their protective measures, fared far worse than the US. These countries at all relevant times had far lower levels of economic freedom than the US. The country that bucked the trend of a decline in growth best is Sweden. Sweden is also the country that underwent the biggest deregulation (ie became freer) between the two periods. That of course still does not mean that the share buyback trend is a force for the good, or that it doesn’t matter. It is, on the face of it, worrying that companies do not invest in machines, technology and training of workers, instead choosing to cannibalise their own shares. This is bound to be less than optimally productive. But knowing that, still begs the question: was it free enterprise that caused it? Why did this tendency increase so much during the period 1980 to date, as correctly pointed out by the author? “On account of loose monetary policy and the subsequent increase in the money supply, the process of wealth transferring from wealth generators to the holders of the newly created money is set in motion. Since this new money was generated out of “thin air,” nothing was exchanged for it hence we have here an exchange of nothing for something. It is no wonder the US economy has suffered. For our purposes the important point is that the increasing (and damaging) trend of growing share buybacks is more than explained by the Fed artificially pushing interest rates down, in effect pumping money into the economy. Needless to say, this process of priming the economy by means of low interest rates, is government intervention in the economy. It is not the free market at work. In a free market money would simply be a liquid medium of exchange, and interest rates would reflect supply and demand of real credit. In a fast-growing economy interest rates would tend upward, because demand for credit would increase. That would encourage ordinary people and businesses to enter the loans market. Conversely, if for some reason the growth rate of the economy declines, so would interest rates. Now we can return to the notion that companies should not be run in the interest of their shareholders. That is like saying people should not obey their survival instinct. In a properly functioning economy, businesses would operate like the corner café or the local tailor: They would aim to serve their customers by giving the best value for money, because they would be driven by the selfish and normal urge to better their own economic well-being. To the extent that companies hire professional managers, the latter would be rewarded on a fiduciary basis, namely that contractually they are obliged to serve the interests of the company first and foremost. That is economically to all intents and purposes indistinguishable from the interests of the shareholders. Employees should receive rewards and favourable terms and conditions of employment to the extent that they serve the interests of the company in that sense, and not as an aim in itself. Any suggestion that any other outcome is possible, likely or desirable, is clearly nonsense. The point that is made here, is that no market is completely free from state intervention. To this one’s instinctive response is to say: so what? There is no such thing as a completely free market. Even hard-core libertarians allow for some state role in the economy. For example, today it is generally accepted amongst free-market advocates that a country practising free enterprise policy should have a court system; a law of contract; property laws; a sound monetary system, and so on. In practice there are of course more interventions than those. In Hong Kong, probably the freest economy on earth, the state pays for education and housing for example. But the state interferes less than in any other country. The point is that economic freedom is a relative concept. And the evidence is overwhelming that as a rule the freest economies fare the best in terms of any criterion yet designed for measuring life quality, including income, poverty relief, happiness, environmental protection, health, education and human rights. The author’s tacit subtext is of course that state intervention is a good idea, and works better. For example, the bailout of Freddie Mac and Fannie Mae in the US is cited as examples that prove that the government in America intervenes in the economy. Whether this is a good thing, is seemingly taken for granted, without a shred of evidence. Who knows what the effect would have been if these institutions had been left to their own devices? We cannot assume what that would have been. The argument is similar to the one about the so-called developmental state, of which the Asian Tigers are typical examples. It is assumed that Singapore proves the case. But between 1961 and 1997 the per capita GDP in constant dollar terms of Singapore and Hong Kong were almost identical. For all its developmental strategizing, Singapore was slightly behind in the race, while the freest country, with the least intervention of any in the world, was slightly ahead. That raises the question: Was Singapore effective because the state intervened, or in spite of it? Then Hong Kong was handed over to China, and investment rates dropped. But until then, the laissez faire economy of Hong Kong was at least as good as the slightly more interventionist one of Singapore. It must be emphasised at the outset that, despite the activism of the Singaporean government, in the period that of 1960-2015, both Singapore and Hong Kong were two of the freest economies on earth – in fact, throughout most of this period they were numbers one and two on indices measuring economic freedom. To a large extent, this explains why they greatly outclass the other Asian tigers, and indeed all other states in the Far East. As a further example, the author makes the point that all countries today have anti-child labour rules. The implication is that it is the anti-child labour rules that caused child labour no longer to be used. This inference is drawn because of the coincidence of both the rules and no child labour in the same country at the same time. There is of course a good chance that the opposite is true, namely that the country can afford the luxury of such laws because it is wealthy enough to send all its children to school. That is, wealthy, successful countries do not need these rules, and in failing, poor countries they do not work. “In Cambodia, the state had ratified both the Minimum Age Convention (C138) in 1999 and Worst Forms of Child Labour Convention (C182) in 2006, which are adopted by the International Labour Organization (ILO). For the former convention, Cambodia had specified the minimum age to work to be at age 14. Despite the laws implemented by government, economic necessity dictates that child labour be used. The converse is just as true. In a successful wealthy economy, there is barely any demand for child labour. The offending countries are desperately poor without exception. The best of them is Myanmar at number 133 out of the total of 198. The poorest country in the world, Somalia, is also on the list. As for economic freedom, the offending countries whose economic freedom has been rated, all fall squarely in the bottom 25% of free countries. The statistics for the countries with the least child labour are not readily available, but education quality is a good indicator of child welfare. The 10 best countries in terms of education, according to the OECD Better Life Index (with their free-market rankings out of 159 in brackets) are Finland (17), Australia (9), Denmark (15), Germany (23), Slovenia (73), Japan (39), Sweden (27), Poland (51), Ireland (5) and Korea (32). Their per capita GDP rankings (out of 197) are Finland (28), Australia (20), Denmark (23), Germany (19), Slovenia (41), Japan (31), Sweden (18), Poland (47), Ireland (7) and Korea (33). All the countries are relatively free-market countries with high incomes. No one can seriously contend that it was child labour laws that were responsible for the wealth and well-being of children in these countries. The inference is irresistible that they would have been well off in any event. Children in wealthy countries are sent to school, not put to work in factories. Children are enabled to become as productive as possible. The converse is true in unfree, poor economies, where parents (sadly) choose to use their children’s labour to survive. . The same applies to rules like labour standards and minimum wages. Poor people (the poorest 10% of the population) in free-market countries earn about ten times as much as their counterparts in unfree countries. Minimum wages have absolutely nothing to do with this. Productivity that comes with economic development, education and training has everything to do with it. A good example is the clothing industry, where – despite the threat of forced closure – hundreds of clothes factories for years operated below the levels imposed by bargaining council minimum wages. In poor countries these standards on the whole do not help. Quite clearly it pays to be ranked ‘Good’. Average employment growth in this group is about 4.5 times higher than in the ‘Fair’ group, and 5.5 times higher than in the ‘Poor’ group. A more dramatic illustration of the value of low regulation is to compare the percentage of jobs created over the same five-year period for all the states in each group combined. The ‘Good’ group’s employment growth was 4.4 per cent, while that of the ‘Poor’ group was a measly 0.6 per cent. In other words, the ‘Good’ states proportionally created more than seven times as many jobs as the ‘Poor’ states did. In actual numbers, the ‘Good’ states created 2 124 734 jobs (starting from about 47 million), while the ‘Poor’ states created only 390 551 jobs (starting from a much larger 62 million). Labour laws and minimum wages not only had no beneficial effect on incomes in the Poor states; it exacerbated them drastically. It is enough to conclude that while it is true that most, in fact all economies contain mixtures of freedom and state intervention, that tells us nothing about the superiority of either. [i] ‘United States real per capita personal income growth by state: Average annual percent change, 1959-2015’, United States Regional Economic Analysis Project, November 2016, available at https://united-states.reaproject.org/analysis/comparative-indicators/growth_by_decade/per_capita_personal_income/reports/#page_3 (last accessed 1 April 2017).